Eating a guava a day may help you lose weight naturally. Without compromising your intake of proteins, vitamins and fibre, guava helps you lose weight by regulating your metabolism. It's a win-win! If you are the only person who has to skip birthday cakes, cupcakes and donuts and is constantly worrying about the calories you are taking in, then you're not alone. There are many people who control their cravings in order to avoid the intake of unhealthy and junk food. We are not saying that one must avoid eating cakes or donuts totally, but eating them in moderation may not harm you. Moreover, following a crash diet or fad diet are not healthy and often tend to wreak havoc on your health in the long-term. Losing those extra kilos in a healthy way will bring a lot of benefits. Eating fresh and seasonal fruits and veggies are not only good for your health but also support your weight loss process. Green, crunchy guavas are back in season and we can't wait to have them. You enjoy it freshly cut with a pinch of chaat masala or eat it in your salad; better still as is, the choice is yours! But, did you now that other than its amazing taste, guava has a host of benefits too, which makes this fruit a universal favourite? 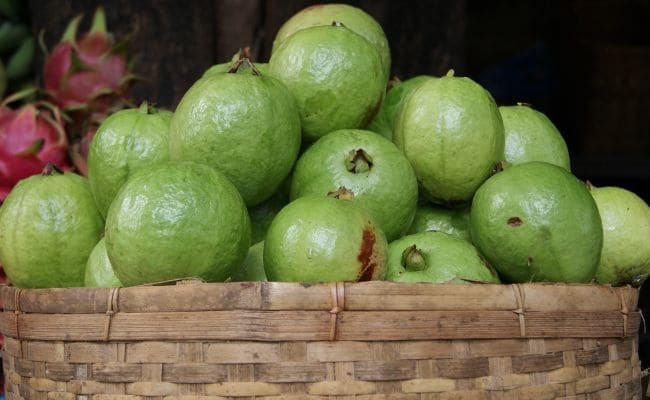 According to Macrobiotic Nutritionist and Health practitioner Shilpa Arora, "Guavas are a low GI fruit and do not raise blood sugar levels and helps in managing weight. It is the best fruit for hormonal imbalances. Diabetics and weight watchers can enjoy this nutrition-packed fruit." As per Dr. Manoj K. Ahuja, Sukhda Hospital, "guavas, or amrood, are also rich in manganese, which helps the body to absorb other key nutrients from the food that we eat. Other than this, guavas are rich in fibres which help facilitate smooth digestion. Fibre adds bulk to the stool, thereby aiding bowel regularity." Guava is packed with fibre that delays digestion and helps induce the feeling of fullness and satiety. When you are full, you naturally refrain from bingeing into other high fattening foods, thus making way for effective and natural weight loss. Being a low-energy dense fruit, guavas are low in calories. In other words, if you are taking a large serving size of guava, you will feel full and energised in very few calories. Here are the total calories in guava, depending upon their weight and serving size. A 100-gram serving of guava has 68 calories, as per the United States Department of Agriculture. A 100 gm serving of the fruit contains just 68 calories, 5.4 grams of fibre and 2.55 grams of protein, according to the data of United States Department of Agriculture (USDA). Guavas are also rich in calcium as they contain 18 gm of the mineral per 100 gm of the fruit. It also contains 22 gm of magnesium per 100 gm of the fruit, as well as significant amounts of phosphorus and potassium- 40 and 417 gm per 100 gm, respectively. Without compromising your intake of proteins, vitamins and fibre, guava helps you lose weight by regulating your metabolism. It's a win-win! Guava makes for a very filling snack and satisfies the appetite very easily.